Sometimes in sport you see performances of such strength and authority that the only adequate response is to stand back and marvel. 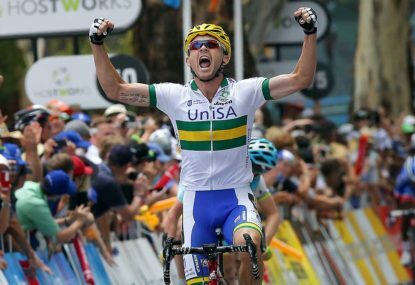 Jack Bobridge’s victory in the Australian road race championships was one of those rides that almost defied sense, a masterful raid that ripped apart a peloton of Australia’s best, on one of the toughest days of bike racing you will ever see. Cameron Meyer (Dimension Data) showed the motivation and freedom of a new team to claim the silver medal, and Pat Lane (Avanti Isowhey) richly deserved his surprise bronze. Simmering in the heat of Mount Buninyong, thousands of fans lining the route saw a race short on tension, but so it goes when someone produces such a masterful performance. Such was Bobridge’s dominance that the spectacle was a matter of disbelief turning to admiration and then into outright awe as the peloton imploded behind him and the result became clear. Jack Bobridge, the mercurial one. This was an outrageous feat of daring and strength. 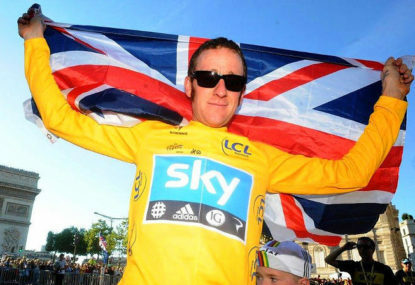 Nearly a year ago the world watched him tear himself apart on the velodrome in his failed attempt at the Hour. 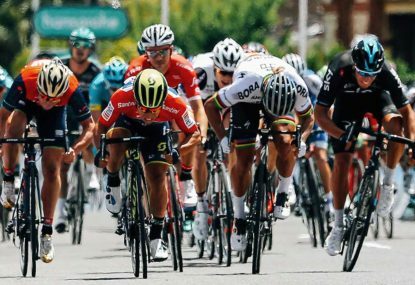 Yesterday he tore some of the best in the world apart, with a race-long breakaway, in the heat, over four and a half hours. He rode more than half the race by himself, with some of the world’s best riders chasing him, and held them off. Not just held them off, he forced them out of the race. Out of 127 starters, only 15 men finished the race. 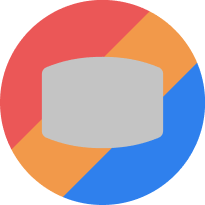 An attrition rate of 88 per cent. The cream of Australia’s National Road Series and hardened World Tour professionals alike had their arses handed back to them by a man with half his focus on Olympic gold on the velodrome. It was a trainwreck for Orica-GreenEdge, with only Simon Gerrans managing to finish. Truth be told, the team looked rattled from the beginning, only briefly showing the kind of organisation and control they have become renowned for in previous years. 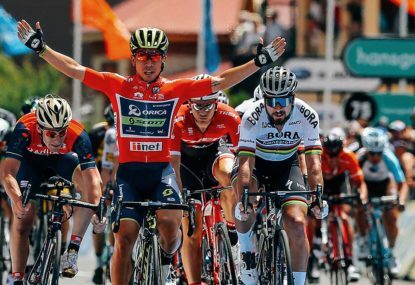 For a couple of hopeful laps, Mitch Docker, Michael Hepburn, Jack Haig, Damien Howson and Luke Durbridge seemed capable of dragging Gerrans up to Bobridge, but the effort was too much in the heat, the gap barely moved, and carriages started popping off the OGE train blowing steam. As I wandered back down the hill to see the finish, I spotted OGE bosses Gerry Ryan and Shayne Bannan deep in conversation in the feedzone, wearing philosophical poses but surely wondering how it all went wrong for the second year in a row. At least they had two ex-teamies on the podium. World Tour teams still dominated the top five spots, but it was Bobridge’s Trek-Segafredo on top step, with Dimension Data (Cameron Meyer and Nathan Haas) and Tinkoff (Jay McCarthy) joined by New Zealand-based continental squad Avanti Isowhey (Pat Lane) defeating the numerically superior OGE and Drapac squads. Avanti Isowhey deserves special praise: with third, eighth, ninth and 12th position they had more finishers than any other team. On a results-per-dollar-spent basis, they won by several laps. To be fair on the OGE boys, many big names suffered badly. Richie Porte’s first outing in his new BMC colours finished with an early ice bath, after cracking on the climb. Pre-race favourite Caleb Ewan (OGE) never looked in the race. 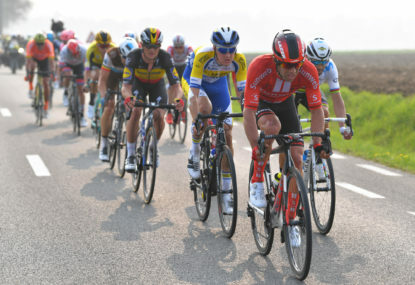 Known hard cases Simon Clarke (Cannondale), Adam Hansen (Lotto-Soudal) and Rohan Dennis (BMC) battled hard but came up short. Why such carnage? A combination of heat, wind and relentless pace from the race leader. The mutterings about moving the national championships away from Buninyong seem to grow louder every year, but there’s no denying that the circuit provides a true test. You might even argue it’s too tough, given the quality of the riders it broke today. The destruction started early, with a group of 20 riders attacking almost immediately and quickly building a lead of around nine minutes. Bobridge and Bernard Sulzberger (Drapac) splintered this group with an attack on the Mount Buninyong climb (where else) with more than half of the distance still to ride. For a few laps the pair worked together before Sulzberger cracked and Bobridge surged onwards with more than half the race distance still to cover. By Lap 10, with Bobridge powering around the circuit lapping some of his fastest times of the day, the remnants of the break smeared across the road, and OGE calling its riders together to organise a chase the crowd began to calculate the odds, and they looked pretty slim. As the lap countdown progressed, his lead remained steady but the chasing group got smaller and smaller. We began to sense we were seeing something special. By the time Bobridge crossed the finish line with his arms aloft, it was clear that on his day he is still a very special rider indeed.